Jami Mosque (the second name of the mosque is Juma Mosque Khoja Ahrar Wali) - a modern building, which has a very ancient history. Medieval mosque and madrasah, the foundation of which was laid in 1451 by Sheikh Ubaidullah Hoja Ahror, he was a descendant of the Prophet Muhammad. Getting ready to move to Samarkand, the spiritual leader decided to build a mosque and madrasah for the residents of Tashkent, which is the basis of the central architectural complex. So the magnificent Jami Mosque appeared, or as it is also called the Friday Mosque. In 1888, the main building maksouda, located in the western end, it was rebuilt, and the arch-domed gallery surrounding the courtyard were rebuilt in the residential khudjras. In 1868 the building was destroyed by a major earthquake, but was again restored by Russian tsar Aleksandr III. Today the building has fragments of the first construction and the original foundation. The unique of the mosque is that it has an elongated construction along its east-west axis. Juma Mosque Hoja Ahrar Wali is an architectural monument of XIV-XV centuries. Jami Mosque is the third largest mosque in Uzbekistan. 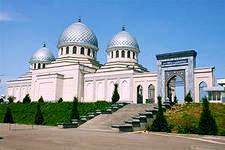 It is also the only building of the city cathedral mosque of courtyard type in Tashkent.